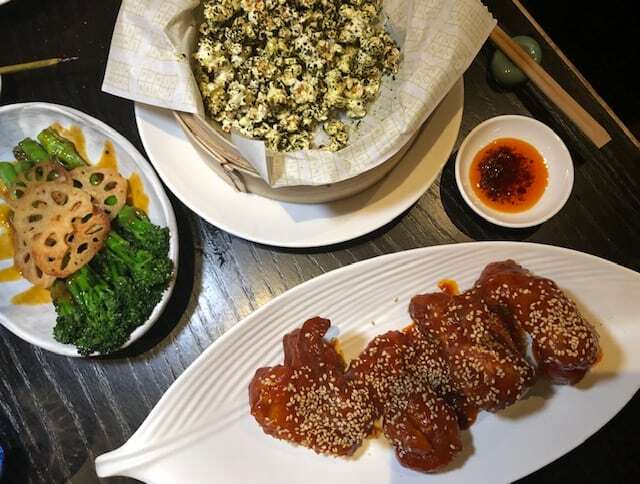 Flesh and Buns is my favourite Japanese restaurant in London with two venues in Fitzrovia and Covent Garden. 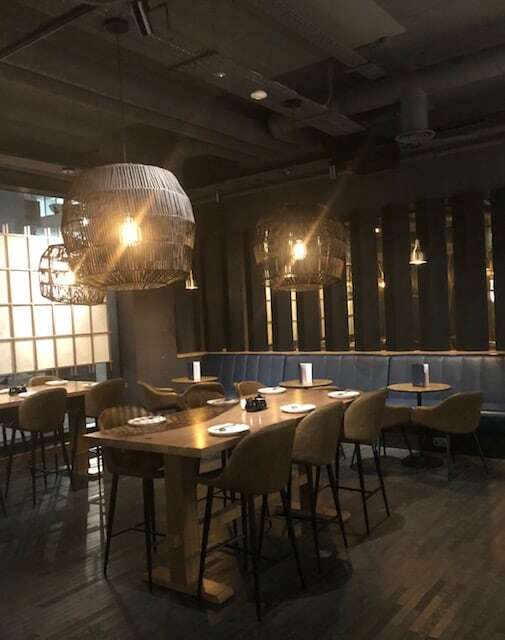 We visited the Fitzorvia branch which only opened in October 2018 and offers a 170 cover dining area. The restaurant is pretty swanky without being pretentious. Think oaky furnishings, gorgeous light fittings, plush seating and Japanese décor. 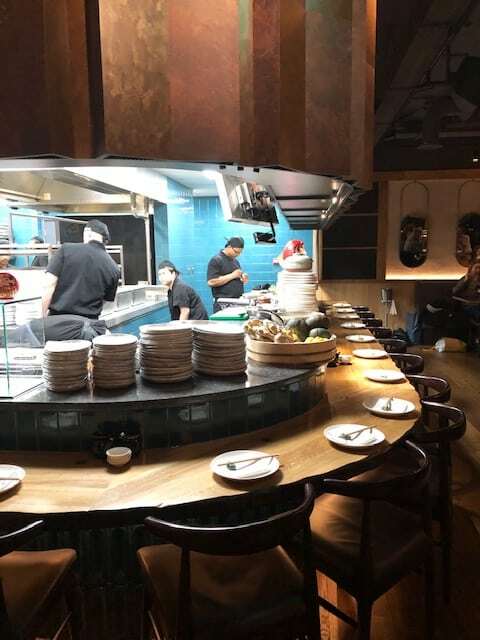 The open kitchen with seating creates an open atmosphere where you can watch the chefs at work. There are some booths available for larger parties so perfect for Christmas events! Everyone loves a gimmick and press for champagne has been done before. So what do Flesh and Buns do? Well they install “Press for Pisco” buttons on every table! Obviously a clear talking point but did it have any substance? Obviously I pressed the button to try! 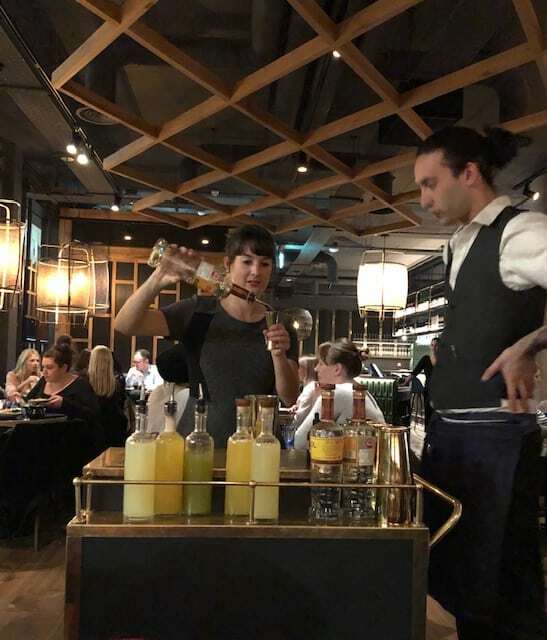 Just seconds after pressing the button, I was greeted by a gold trolley displaying all of the ingredients for a Pisco Sour. The lovely waiter asked if I wanted to make the cocktail so off I went with a little help along the way. It was pretty awesome making our own pisco sours. 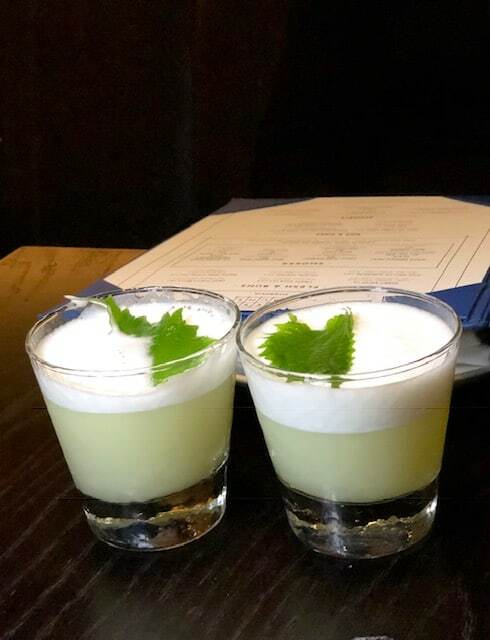 We opted for the Shiso and Green Apple: Pisco, Sour Mix, Shiso Green Apple, Shrub, Egg White (£10). I may be biased but we thought it looked and tasted pretty good. Flesh and Buns also offer a number of other cocktails ranging from £8-10 – the infamous Frozen Yuzu Margarita has made it over from the Covent Garden Menu to Fitzrovia! If cocktails don’t tickle your fancy, there is a huge range of sake and Japanese whiskey. 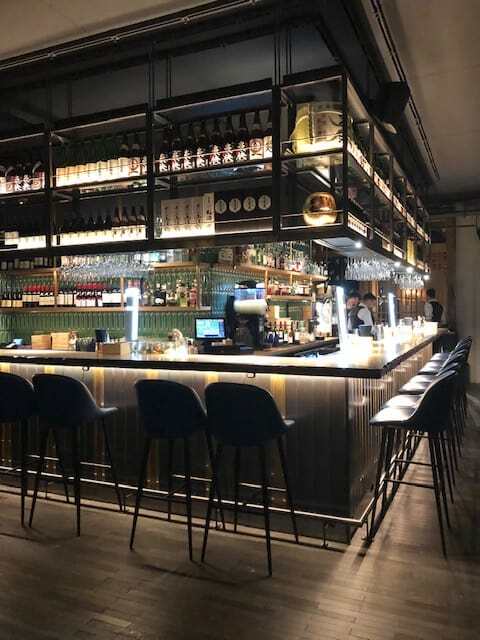 The menu focuses on Nikkei cuisine (Japanese Peruvian fusion) with a mixture of sushi, seafood and meats from the new smoker. 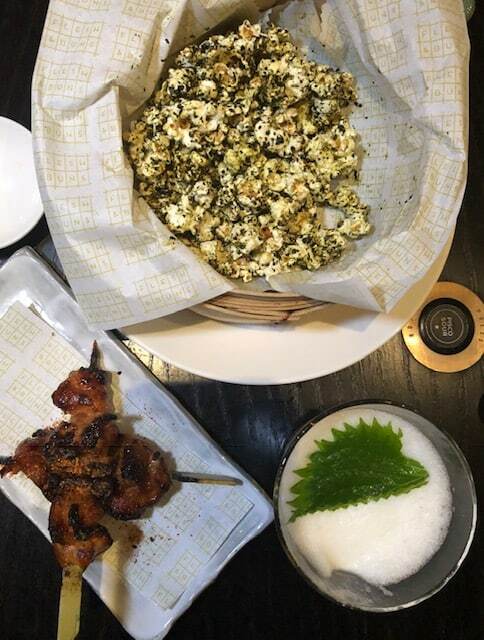 We kicked off with some Curry & nori popcorn with salted butter (£3.5). This was seriously moreish albeit a little greasy for us (most probably the butter!). The chicken yakitori with shichimi pepper and fried shallots was a bargain for two skewers at £4.90. The chicken was moist and the coating on the chicken was great. The Korean fried chicken wings with spicy sour sauce (£7.40) were something else. 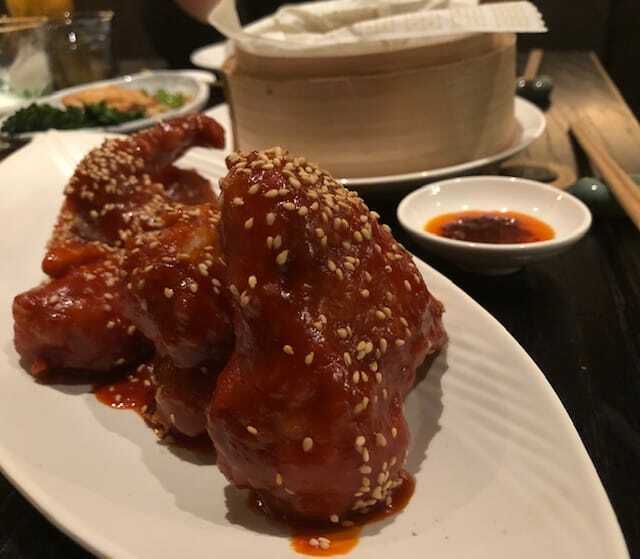 We were presented with four chunky wings coated in the amazing spicy sour sauce. There was a decent amount of meat on the wings, they were sticky, messy and all kinds of delicious! The sesame grilled broccoli with orange miso, sesame and lotus chips (£5.90) was fantastic with the perfect level of orange miso. We could have easily sampled all of the flesh and buns and the dishes cooked on the smoker. 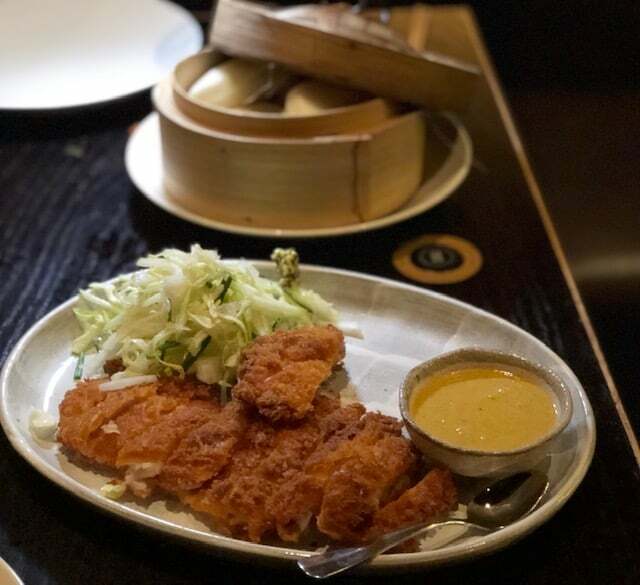 After a quite a lot of deliberating we opted for the Rabbit katsu fennel, cabbage, apple salad, ama zu dressing, curry mayo (£16) with hand-made steamed buns. The meat was succulent on the inside and crispy on the outside. The katsu sauce was delicious and we packed the bao to the brim with delicious filling. 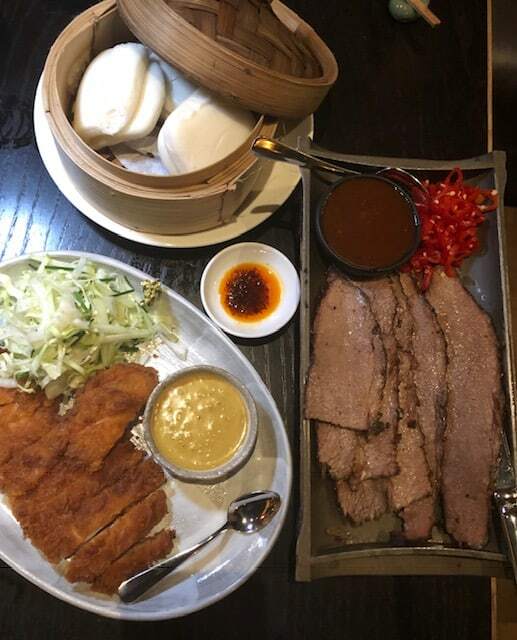 The Chilli miso brisket with chipotle miso bbq sauce, red chilli pickle (£17) stole the show. The meat was unbelievably tender and melted in my mouth. The combination of the bbq sauce and red chilli pickle provided a kick without being overpowering. We did not have room for dessert but the S’mores with Passion Fruit Marshmallows, Almond Chocolate, Graham Crackers looked absolutely immense. 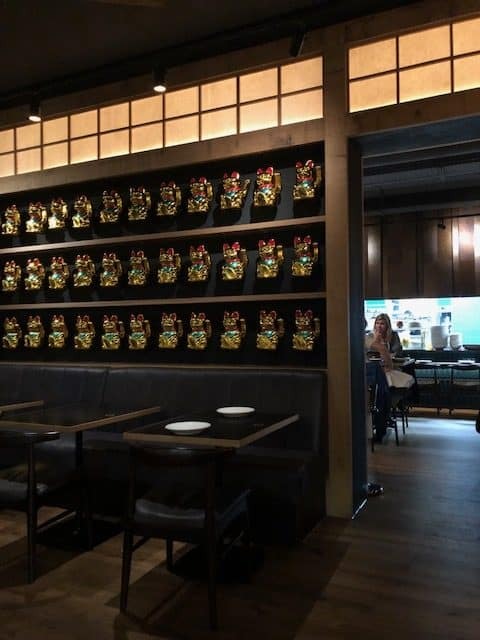 Flesh and Buns is an amazing Japanese restaurant with locations in Covent Garden and Fitzorvia. The ambiance, great service and awesome food makes it a must visit! Plus they offer a weekend brunch menu for £25 with free flowing prosecco, red wine or white wine for only £15pp.